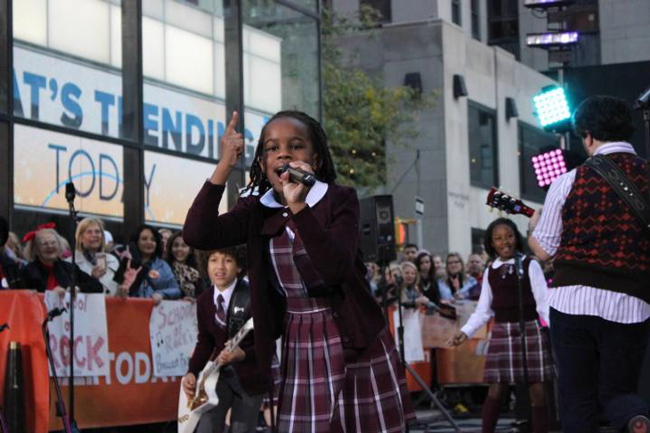 12 year-old Bobbi MacKenzie is an actress, songstress and all out performer who made her Broadway debut as an original cast member of the Tony nominated “School of Rock” the Musical. In the early part of 2015 Bobbi's voice and presence caught the attention of the legendary Andrew Lloyd Webber who later went on to personally offer her the principal role of Tomika in "School of Rock the Musical" at the Winter Garden Theatre and welcomed her to Broadway. At the age of 10 years old Andrew Lloyd Webber's vision for Bobbi MacKenzie continued to reveal itself as he requested that Bobbi represent "School of Rock the Musical" at the "Broadway at the White House" event hosted by Michelle Obama. Bobbi has since been on Good Morning America, The Today Show, The View, The Wendy Williams Show, TEDxPortland, The Tony’s and numerous local Portland, OR TV programs. Bobbi MacKenzie has also recorded/worked with the Grammy award winning producer Rob Cavallo on “If Only You Would Listen” featured on the "School of Rock” the Musical original cast recording. Bobbi MacKenzie belted out her first sound at the tender age of 3, singing her favorites on the radio without missing a beat. At the age of 5, Bobbi expressed her appreciation for great music and iconic voices by naming Erykah Badu as her favorite artist. One could say Bobbi MacKenzie was born to perform. With her mother being a radio personality, she could hear the music before she was born. Bobbi MacKenzie began hitting the concert scene with her parents before she could walk, reacting to her first set of music concerts performed by the likes of Mary J. Blige, Jay Z, Pharrell and Kanye West. In 2012 Bobbi MacKenzie made her debut singing the national anthem for the NBAs Portland Trailblazers and has since performed for the Golden State Warriors, Sacramento Kings, New York Knicks, New York Rangers, New York Jets, Atlanta Hawks and the San Francisco 49ers. Bobbi MacKenzie is also an honor roll student who enjoys reading and even a little math! She prides herself on being the "big sister" and enjoys spending time with her two sisters, Madison (age 9) and Aubree (age 4)... showing off the latest dance moves and weekend slumber parties at home watching Nickelodeon and Disney channels. Fun! Copyright © 2015 Bobbi MacKenzie | actress and songstress All Rights Reserved.